Kirsten has a keen interest in textiles and design, with her creativity leading to a Foundation diploma in graphics. Alongside her creative work, she found a love for circus arts and actively got involved with training in trapeze and aerial silks. Proving her success in these performances, Kirsten moved on to teach pupils aerial arts at School of Larks, a local circus school, with students ranging from 2 years old to adults. 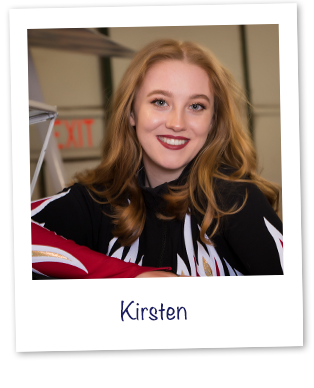 Kirsten feels incredibly blessed to have the opportunity to become a Professional Wingwalker, and enjoys travelling around the world performing. So far, her favourite view was watching the sunset whilst loop-the-looping over the Gobi Desert! Getting the job was a dream come true for Kirsten and the sky is now like a second home to her. She loves looping and rolling around on top of such beautiful planes all over the world! Gemma graduated from the Northern Ballet School in July 2016 and since then she has been dancing professionally within the performance industry. Her most treasured experience was touring Panama performing with a Mexican circus, closely followed by 7 months dancing in Crete. She would call herself a bit of an ‘adrenaline junky’ loving roller coasters and activities such as skiing and scuba diving. Gemma is also trained in aerial circus arts specialising in silks and hoop. Gemma’s adventurous spirit found her in India where she qualified as a multi style yoga teacher and enjoys instructing her weekly class. She likes to fill her spare time with art projects, specifically painting with acrylics. 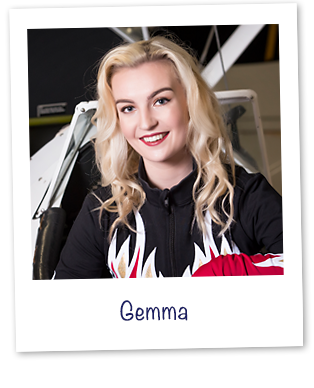 Having a father who’s job revolves around light aircraft means Gemma has been flying and involved in aviation from a young age. She first saw the team performing at Shoreham airport when she was 7 years old and was totally in awe of the display. She never thought that would be her standing on the wing! Gemma feels incredibly privileged to have been given the opportunity to join the team as a full time wing walker and is excited to perform to audiences around the world and make the sky her home. Katie is a local girl born and bred in the Cotswolds. Growing up on the family farm isn’t always so glamorous and her time leading up to the airshow season will be spent doing what she enjoys, lambing! Keen on sport, she is a avid netballer, and plays in the Country Premier League. She has 6 years of gymnastics experience behind her, which really helps her perform the moves on the plane. The vintage planes are a real delight to work on, a bonus for Katie as she loves the 30’s and 40’s and takes part in the always energetic Swing and Jive dancing. The re-enactment societies and vintage villages at the shows are the highlight! After two seasons full time, Katie has travelled as far as China and the Philippines, as well as up and down Europe. Flying everywhere in an open cockpit can be gruelling at times, sometimes fighting the weather, however the bond between pilot and wingwalker never fails, passing sweets and snacks between cockpits, whilst pointing out landmarks only visible from the sky, as well the occasional double rainbow. Katie says there have been many highs from travelling, but nothing yet has beaten flying to Switzerland through the South of France and Italy, the sun being so hot they could fly in short sleeves, and the scent of rosemary hanging in the air. Katie’s favourite part of being a wingwalker is swivelling and hanging upside down! She says there is no feeling like the first flight back after the winter. The adrenaline rush mixed with high speeds and handstands, is one that can’t be described, she can’t help but shout out a declaration of elation! practicing for her skydiving in the wind tunnel so is used to moving in high wind speeds in all types of flying orientations which will help her climbing around the aircraft in flight. Gina always knew this would be the job for her when she first saw a picture of the team performing over the Palm in Dubai. 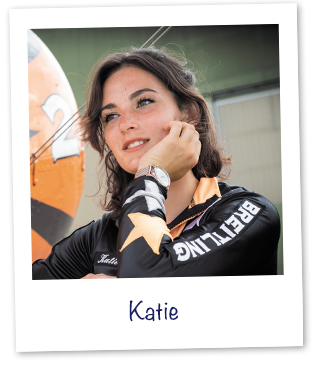 There was no looking back from that moment on and after watching a promotional video that was posted on the Breitling Wingwalkers website, she approached the team and began the application process immediately. Outside of skydiving and wingwalking, Gina enjoys a number of outdoor activities including skiing, scuba diving and rock climbing. Nikita graduated from Cardiff University where she studied Psychology and Sociology. After moving back home to Northleach in 2013 she was thrilled to find an advert in the local paper for a part time wingwalker. As a child, Nikita went to many airshows and was frequently a spectator at the Royal International Air Tattoo, Fairford. She says she was always captivated by the magic of the team and the amazing display, but never thought it would be possible to be a part of it. Her family have always been involved in the aviation world, her mother and father were both in the RAF and her father continues to fly today for an airline. Because of her parents love of flying they were extremely excited when Nikita said she wanted to apply for the wingwalking position. However they thought she was mad wanting to be strapped to the outside of the plane rather than be inside it! Nikita says the thrill of wingwalking provides a sensation that very few are lucky enough to experience and nothing compares to the speed and exhilaration of diving into the sky and pulling out of a loop. Nikita is also a primary school teacher. Her pupils are always a little surprised when they first learn about her weekend job on the wing!